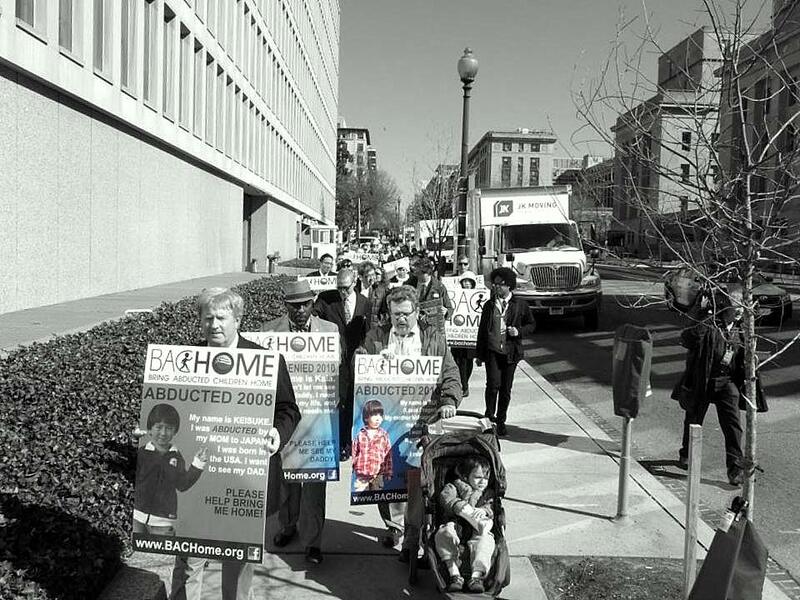 Parents of Japanese Child Abduction March to the State Department Washington D.C. – March 31, 2014. These are not optimistic times, not here or anywhere. Maybe this is as good a starting point as any. My topic is one such Holy of Holies: and though it is almost impossible to exhaust or encapsulate with a word or a name, I’m forced to admit, despite some reluctance, that the topic is in large measure concerned with an institution with immense baggage, considerable importance, and fraught politics, inclusive of all its countless transformations, the family relationship, between a parent and his child. Sigh! That reluctance shouldn’t be misunderstood! But my friends know by now that I have rapidly moved into the ‘schoolroom’ of thought where it is not possible to use a term like family without invoking the vast historical, period, legal, gendered, national, social, psychological, developmental, and economic placements, privileges, and painful histories that complicate and situate the thing. The family must be historicized and periodized, as Jameson would have us do. All of these have deep and complex affects associated with them; so the first order of business in approaching this, whether I choose it or not, is to do battle with the emotions. Strong emotions. Shattering emotions that disrupt, interfere and don’t ever let go, no matter how much clinical intervention takes place. That reflective work is work, taxing work that is so often invisible to the socially constructed eye, well, is another topic for a book, or at least, another blog post. Or two. Americans have a psychological ‘thing’ they talk about a lot: it’s got something to do with the obligation to recover. Well! I am writing today from a kind of knowledge- a place of experience – that says the obligation may sit up in its superego spot and cast aspersions down on us mortals, (and does so with a totalitarian smiley face imposed over its brutal demands); but no matter how much bio-neurological, brain-structure and chemical materialism we bring into battle with the free-will mafia, no matter how much synthesis in defense of faith in future miracles somewhere further on into the utopian horizon, the real horizon, for me at least, remains with Freud’s “Third Copernican Revolution” that we are , most certainly not masters of our own houses, nor are we simply engaged in building rational-mastery to arrive at an inevitable outpost of Virtue, nobly perched at the apex of our species being. So it would be. I am struggling to write about this, and so is everyone else struggling, fighting fierce demons, memories and internal and external upheavals, on top of those end-of-the-world apocalyptics we witness daily. The irrationality with which humans are now behaving seems to me fueled by an excess of traumatic, rending social forces, invisibly removing the foundations on which lives have been lived, where a new foundation is hardly yet imagined, much less in fieri. Eventually, I hope there will be many of us working on the topic of Japan’s parental abductions in various contexts, its history and genealogy, its place in the history of U.S.-Japanese and international relations, in politics, in the psychological and ideological space of loves and hatreds, and the evolving regime that is now taking shape in which those abductions are formalized into an evolving “legal” framework. In the news this April 2014, Japan joined the other 90 member countries of the Hague Convention on the Civil Aspects of International Child Abduction after 30 years of evasion, stalling and delay while the annual rate of abductions skyrocketed in the era of globalization, year after year. A game with language continues (that is, in the realm of law games, court decisions, and their reception and diffusion in the media) but the stakes of the consequences of those games couldn’t be higher for us. It is our Holy of Holies. The Japanese state has stolen our children from our homes, and the message could not be clearer: the United States and the Government of Japan have used this Convention as a means to rinse us and our children off of their plates, to prevent justice from being done, to evade the obvious outrage that this prevents our children being returned to us, and prevents the parents – both the abductors and the victims – from receiving fair treatment and protection. On the Japanese side of this catastrophe are roughly 2.7 million children who do not have a parent/ child relationship because the Japanese state and its family courts have long condoned and rewarded kidnapping children as the best and only means to custody, sewing tremendous division and contention by enabling and supporting it, refusing to protect children from this form of predation, and only bringing the ‘decision’ of the judicial system to bear (along with its accompanying means – police force, arrest, imprisonment) when bereaved parents have tried to assert their will to maintain their parenting relationships with their children after an abduction has taken place. Japanese legal practice holds that only one parent maintains parental right after the couple separate or divorce; the other half of the child’s identity and family are damned and lose any protection from the practices of law. The results of this have been, and are, horrific. The scale of this nightmare is not widely known, but is only now gradually emerging as compared with four years ago when my 4½ year old son, Rui, was kidnapped from the United States and kept hidden in Tokyo’s shadows.
. . . . . . . . . . . . . .. . . This means that 84% of fathers have NO scheme of parenting or “visitation” with their children. That comes to 12 or fewer”visits” per year, with the child you have raised from birth and in whose care you have invested your love and self. The statistics for women and mothers are also very poor, as the article indicates. 77% of mothers say they have no post-separation parenting arrangements to protect their children’s parent/ child relationship, and 65% see their sons and daughters 12 times a year or less. 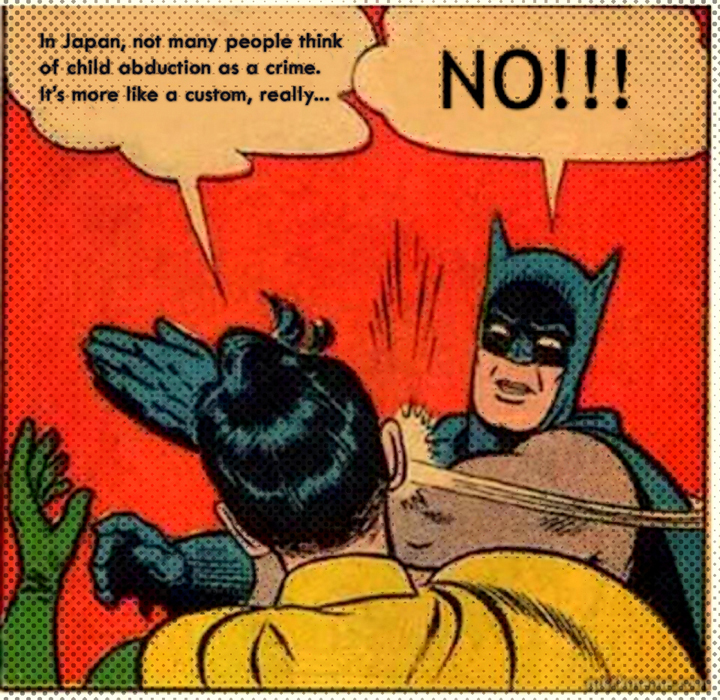 Now, what about “State-sponsored, legalized parental abduction” is hard to understand!? Japan has now created a new agency in the Ministry of Foreign Affairs. Where else would you expect to adjudicate family matters and kidnappings? Ministry of Justice? Ministry of Interior with jurisdiction over family matters? No… the ministry of Foreign Affairs, because after all, the governments of Japan and the United States have made this is a diplomatic issue, rather than one of caring for children and parents and protecting them from harsh abuse. And in a predictable but nonetheless devastating blow, the government has announced that while the Hague Convention requires that a country that has actively supported and condoned international child abduction for decades with impunity create a new all Japanese “Hague” court whose mandate should theoretically be to re-decide which country should have jurisdiction over the futures of kidnapped kids and their families (and should have been charged with this responsibility decades ago), they will continue to remand the cases to the same Japanese family courts that stole jurisdiction. Nothing substantive changes; NO provisions for joint custody or legal requirement of parental or children’s rights exist in the law, case law, or history. To ice the cake, Japan will retain full autonomy in the appointment of mediators, evaluators, social workers and psychologists. Should this be a problem? Most assuredly, yes! Because Japan has NO accreditation or licensing process for these professions in the court, not now, not before, and predictably, will not later either. This is because no licensing agencies or licensing process exists for social workers and psychologists in Japan. Pass a psychology course or not, and you may hang up your shingle, buy ads and advertise your services. Given the impulsion the arrival of the convention provides, this is bound to be a growth industry in the near future – with life and death decision making power over parents and their children, including mine. The agreement of the U.S. and Japan (and the other member states, junior partners in the treaty) to such an arrangement which cedes our children to the network of abductors and sketchy lawyers who have made a career of supplying fodder to feed into the machine of Japanese State-sanctioned abduction of children must be seen in as clear a light as possible. They are in the process of legally reinforcing the sanctioning of the abduction of my son, Rui, and countless other little ones, in a new fold of the envelope, an appearance of an emerging legal order which bears remarkable similarities to the one that came before. If we look at this at all, we find that the governments of Japan and the United States, (as well as most governments worldwide today) have concluded – long ago really – that as representatives of their respective elites – and we must NEVER forget that that is what they are – they are happiest with a weak institutional foundation of global “governance” (or, we call it, international law) and prefer a consensus between them by which they can evade or interpret what international rules do exist, tending toward a specific issue and particular geography. That’s why we got the vague Hague Convention, instead of our children. This is also why the idea that one can advocate effectively for our kids without challenging authorities and the fat cushions of power, privilege and money that they sit on is, in my view, foundationally impossible or implausible. Sovereignty: What’s in a word? There is much to explore about the nature of contemporary sovereignty here, in this context, in the days ahead. Which population, and which resources are protectable, and which are mourned? Ask the State Department, and the answer is in so many words, tough luck. Please stay tuned, and check back with me. And share our story wherever you can. The Hague processes will begin fairly soon, with parents’ full awareness of how badly rigged this game is against us. There is much elaboration to be done to make this more fully and contextually explicable. My title, “Persistence of the Old Regime” is borrowed from the great historian Arno Mayer, who wrote a book with that title (Pantheon, 1981) which portrays the crisis that wracked Europe in the 20th century, two world wars and a struggle with viciously regressive politics, as a product not of an avant-garde, forward thrusting, revolutionary capitalism, eager to transform a world with utopian dreams; but rather as a world dragged down by economic corruption, and an alliance of a newly empowered exploiting class with an aristocratic elite tenaciously grasping onto its slippery, ever less justifiable privileges, an alliance of forces more than willing to subjugate masses of people, and subject them to the eventual mayhem of empire building, world war, and the deaths of millions. All contemporary parallels are intentional. The section of Anderson’s essay concludes by explaining US designs on incorporation of China into a world system in which US corporations and military postures maintain profitability and something approaching the old goals of full spectrum dominance, the nostalgic aim of a fumbling, crumbling empire. and in Nemesis, which contains a study of the impact of the Status of Forces Agreement in Japan, from pp 171-207. Nice post and very well written. I do hope that the U.S. State Department can reunite you with Rui. The Vague Convention sounds like, just another hurdle and not really gonna work with the lack of qualified Lawyers, counselors and true help on our cases. I do hope you can see Rui soon, They owe you that right, regardless of their empty promises thus far. Like everyone in the Foreign community has been saying about Japans way of Handling and implementing the New laws to deal with Abducted and Alienated Children to and within Japan. The Evasiveness will continue through the loopholes and failed legal system. “Rome wasn’t built in a day”………… and Japan will continue it’s decay!! of failure to be responsive to International rights, Human rights, Childrens Rights, Mental health issues and Parental rights. Yet, they talk about a few of their children that have been abducted to North Korea. Let’s Pray and lets hope that they can try to change their International Reputation as a Black hole for Child Abduction. Furthermore, I call on the Japanese Government to put all LBPS in contact with their children immediately.